When Michael decided to join the Army, as a mother, I was not happy with his choice. I told him the military is good if there is no war. He told me "mom, this is what I want to do." He wanted to be a policeman, and he figured the military was the best possible training he could get. Michael called his NCO all the time to see when he could go. He got orders twice before and both times they sent him back...what a relief. Then he got his 3rd set of orders in March, to deploy with the 340th MP Unit. When we brought him to Fort Totten, he was not even on their roll call list. I said ok lets go Michael, but he got in line with the rest of the brave men and women. I was so worried, he didn't really know anyone except two others from the 430th. His home unit. They left for Fort Dix for training, since that was in NJ he was still close to home, only 45 minutes south of us. We did visit him a few times when he was there. He would call at 8:00pm and say, "I have free time can you come get me?" So off we went so we could be with our son. On June 20th he has his 4 day leave before he went to Iraq. We had a going away party for him, and I am so thankful that the people who cared so much for Michael were able to make it. We said a few things and wished him well and that when he came home, he would have an even bigger party. We took him back to Fort Dix on Monday June 23rd, the day before my birthday. For my birthday he made sure I had a computer camera. When he got to Kuwait he called to let us know he got there ok. I believe he was in Kuwait for two weeks, then off to Rustamiyah. I was able to chat with Michael online almost every day. Thank heavens for the internet access that he paid $55.00 a month for. To me it was worth every penny. I spoke with him on the phone once, and the Friday before he died he left a message for us. I hold on to that with all of my heart. On Wednesday Michael was talking to Tiffany on the phone, when she heard loud noises. Michael went to his bunk, his buddy was having a seizure. Michael helped save his life. I didn't know that, and I was looking for him online to see how the other soldier was. He wasn't online. Spc. 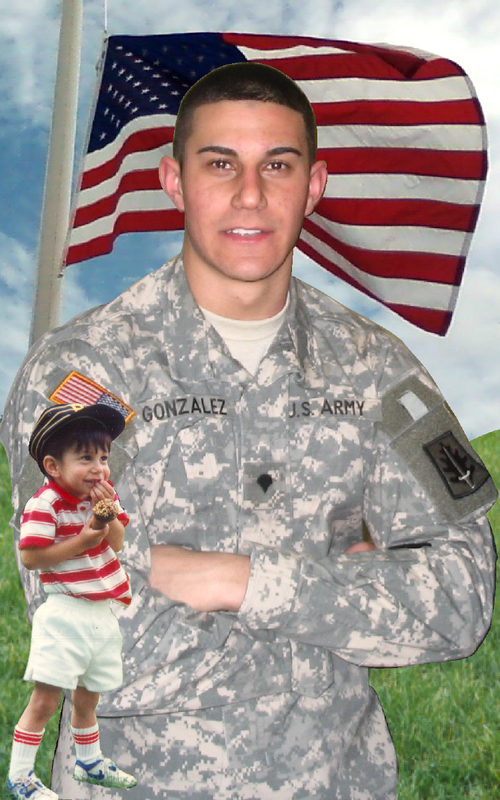 Michael L. Gonzalez was killed in action 8/28/2008. We miss him dearly.